I've set up a Frappr! Map to help locate all the R5 owners out there... follow the link above and get yourself on there! This stuff is pretty neat! Um, yeah, that's not a typo - a jet-powered Yamaha YSR pocketbike. Came across this cool little frame for mounting aftermarket cafe seats to the stock seat hinges on RDs (and I am assuming R5s), allowing you to bolt it to the stock location and maintain the flip-open functionality. This way you can still get to your oil filler and battery should you go with a lower-profile seat. I'm definitely interested. I don't know anything about these guys, the quality of their work or what not, but the pics look good. I'll be contacting them in the near future. 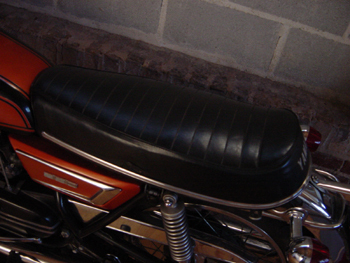 Now there is a simple solution for mounting your custom fiberglass or carbon fiber cafe seat or street tracker seat. Our all alluminum frames are specifically desiged to allow you to bolt the seat hinges and seat latch off of a stock DS7 or RD 250/350. You maintain normal seat operation. No battery modification. Best of all no ugly gap between the seat and the gas tank. Pre-drilled for installation of your latch and hinges. We supply stainless steel bolts, nylon washers, nuts and lock washers. All you need to do is align your seat and drill the holes to match using the pre drilled holes in the seat frame for the hinges and latch. Rounded stainless steel Allen bolts are easily covered by seat padding. Will be listing models for XS650 and Triumph in the near future. Other models to come. These are designed for flat bottomed fiberglass and carbon fiber seat pans. Curved models like the XR750 pans may require some modification. More info and pics can be found at RD Innovations site. BTW they make super-trick CF flyscreens too, to complete the cafe look. Very sharp. Really happy to see your piece on our products in your blog. Just to let you know our seat frames are made out of aircraft aluminum. We are currently supplying seat frames to Moto Carrera and HVC. My business is new and little promotions like this are a real shot in the arm. Thanks for helping us out! No problem Jerry - keep up the good work! Anyone else out there that can help this fellow out? A few people have written in lately and asked me how to identify an R5. After some searching on the internet, I found that there was suprisingly little information about this. So I've decided to repeat a little information from some earlier posts and other sites to get this info into one comprehensive place. 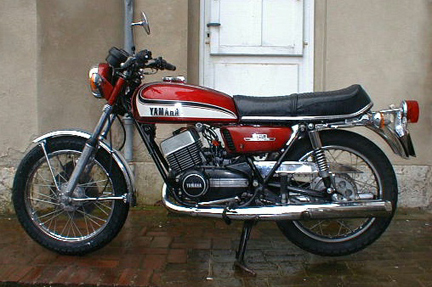 The Yamaha R5 series is the predecessor to the RD series. 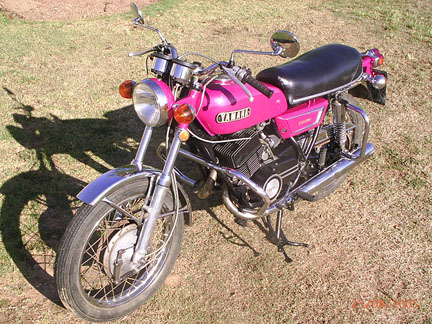 The R5 models were built in 1970 (A model), 1971 (B model) and 1972 (C model). The R5 is a piston ported motorcycle, so unlike the RDs there are no reed valves. It also uses a 5-gear transmission, unlike the later 6-gear RDs. It was very similar to the YDS7, and used oil injection and front and rear drum brakes (the later RDs got the front disc brake). For more information, photos and articles, scroll down the sidebar at left. For official specs, click here or scroll to the very bottom of the page. The R5 shares the same serial numbers for both engine and frame. You can find the engine numbers stamped in large numerals on a flat section of the left side of the case, above the shift lever. If the flat spot is there, but no number, most likely you have a replacement case. The frame number is also stamped in large numerals on right side of the neck of the frame, just in front of the tank. You'll need the free Adobe Reader to view and print the files. Don is a very talented striper, flamer, letterer and artist located in Costa Mesa, California. There's some really good stuff on his site - check it out! Special thanks to Don for sharing this info. Some folks wrote in over the weekend to say hi and ask a few questions about the successor to the R5, the RD350. The RDs are very similar to the R5s, sharing most of the parts, with the most notable advances between the two models being the addition of a forward gear (up to 6), a change to reed valves in the carbs, and the switch from a front drum to a front disc brake. Anyways, I thought I'd share our conversations. I just thought I'd drop a line and comment what a cool site you have. I bought this one about 3 months ago. It is a 1973 rd 350 the offspring of the r5 with only 4000 miles on it. I have all intentions to do what you are doing, Mildly customizing it. The odd thing about it though is, there are no serial numbers on the motor anywhere, the left side and right side gearbox casings where never stamped. No one at the shop where I had it saftied has heard of this. Anyways in the works is aluminum alloy rims with chrome nine gauge spokes, boysen reeds, port job, electronic ignition, K&N air filter, and a proper paint job. I already started to polish all the aluminum on it. I was thinking of a set of D&G pipes, but the stock exhaust looks more vintage and I don't really want to race the thing. It sure is a head turner. It is amazing what a set of clubman bars do to change the appearance. Once again excellent site, very informative. Wow - impressive mod list you're planning there. Should be even more of a looker when you're done! I agree with you on the pipes - on a fully-faired racer, they look great, but on a street bike that's somewhat stock-looking, with a decent amount of chrome, the low straight stock chromers just look better. And I love me some clubman bars - first mod I did when I got the bike home, after I took off the crazy sissy bar! About the serial numbers missing, I've never heard of that either - unless the casings are aftermarket replacements. Looking at your photos, it appears some of your covers have no paint, and it just might be that they were replaced at some point. For more info on numbers, see post titled Letter from South Africa (10/7/05) below. In the meantime, Chris and Lyndsay, good motoring! And thanks for the kind words and for sharing your ride! The tank is rusted fairly bad on the inside, does the Kreme kit work or should i buy a 1976 tank I found in much better shape? I was lucky, and my bike's tank was coated in WD40 while in storage and there wasn't much rust to deal with, so I never really had this dilemma. But my tank is dented, so I looked around for replacements. But I ultimately decided to keep everything as original as possible, making only small period-correct changes (like the clubmans) where necessary. I've heard the Kreem coatings work just fine, so if you want to keep the bike mostly stock-looking, or keep as many original parts as possible, then this is your route. but if you just want to stay period-correct and get things back on the road ASAP, then going with the better, newer tank is a good idea. Is CDI ignition worth doing , if so whats the easiest and cheapest ? Also needs a battery , saw a Battery Ellimenator (sic), should i get this or put a battery back in? Hmmm... not being familiar with the newer RDs, I'm not quite sure how to answer this. Plus I'm not too good with the electricals on my bike, and right now she's not running due to some gremlins in the charging system that I don't have a clue as to how to remedy. 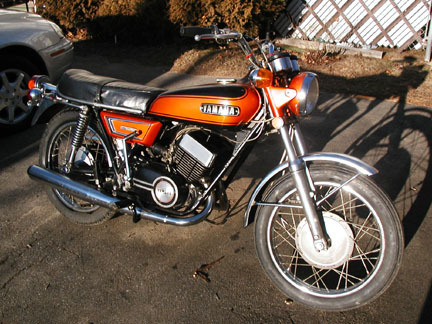 But, according to what I've read, in order to go to a CDI ignition and run a Battery Eliminator, you first must have (or convert to) a RD350LC magneto system. Something about needing to rebuild the crank, add on the LC system and reworking the wiring. Dunno which model RD350 you have. But I'm interested in the idea of the Battery Eliminator. Let me know if you come up with anything further on the subject. Need tires, has a 3.60 H 18 front and a 4.10 H 18 on rear , can't find conversion to new sizes. Dunno about size conversions, but I have heard that Cheng Shin makes tires that are good direct replacements (and period-correct look) for less than about $30 each, and good ol' JC Whitney carries them. I had my mechanic order a replacement front tire to pass inspection, so unfortunately I didn't do the legwork when it came to replace mine. The engine and bike have 6500 miles on, most of chrome and other paint look great , engine runs and sounds awesome, first kick started. I plan to build carbs anyway and few other small things. Sounds like you're on the right track! Sorry I can't help you out a little more, but thanks again for writing in! Send a pic when you get the chance! I recently bought my R5 and rebuild it. It was in storage for 10-12 years and was still in perfect running condition except for the battery and a little rust in the tank, but no problem. It got 26000km on the clock I have got a couple of questions. How can you identify what year model it is? What was the original colors of the models? What is the route of the front brake-, throttle- and clutch cables? Thanks for a great site and I think there is a lot of 350 Yammie owners that enjoy your site just as I do. Wish there were a R5 club in SA. Here are before and after pics of my pride and joy. Quite a looker you got there, Gerhard. Interesting choice in paint! Really like the crash bars on the bike... it's not often you see them on small standard bikes here in the states - usually I see them on big cruisers and the like. Interesting. 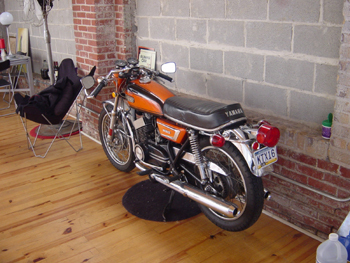 Another good story about bringing one of these bikes back to life from long-term storage. All mine needed was a little cleaning and a new battery too! The R5 shares the same serial numbers for both engine and frame. You can find the engine numbers stamped in large numerals on a flat section of the left side of the case, directly above the shift lever. If the flat spot is there, but no number, most likely you have a replacement case. The frame number is also stamped in large numerals on right side of the neck of the frame, just in front of the tank. In terms of cable routing, I'm not sure... I checked out the official online Yamaha Parts catalog (plenty of diagrams and part numbers for most Yamahas produced) and found this image here. Unfortunately, it doesn't tell much in terms of routing. I had to reroute mine when adding the lower clubman bars, so I couldn't show you a stock setup using my bike... I'd just look at some of my images or links to other R5s in the sidebar at the left of this page and see if you can figure it out from those examples. I noticed that you have bar end mirrors, do you also have stock grips? If so how did you install the mirror on the throttle grip - just cut a hole? Here's the deal. I replaced the stock bars for lower, somewhat uncomfortable, but much better looking cafe bars. In order to get the clutch lever off the stock bar, I had to cut the stock grip. I tried not to, but the sucker wouldn't budge. Once the one was cut, well, I went ahead and replaced them both with open-ended ProGrip 698XL Superbike grips. The 698XLs I ordered wound up being closed-ended, despite the description on the site I bought them from, and they didn't carry the open-ended ones. That's OK, though, as I discovered that I really wanted the 699 Superbike grips... same company, same material, just a cooler grip pattern. And supposedly open-ended. So I exchanged for those. And, of course, they arrive close-ended. So at this point I simply took an Xacto to them and trimmed myself a hole. Both grips, as I had mirrors on both sides. The grips are excellent. They really dampen the vibration of the motor. However, the bar-end mirrors, while looking rather trick, no matter how much tightening and adjusting, they just never stayed put. The one thing I could count on was a good view of the ground behind me or my armpit - not good when you actually need to check your background for a quick lane change. For more info, see posts titled Mirror Swap (5/31/04) and Hmmmm... (7/13/04), below. Hadn't posted this before, but Yamaha Factory Racing has put up a microsite with lots of good images of the days of racing glory past. Check it out here. Lawrence, I found your website searching through google and I wanted to drop you a line and ask a few questions. My dad has one of these babies sitting in his shed, probably the exact same one as you have. 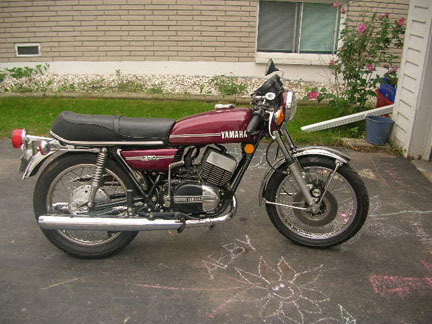 It's a 1972 Yamaha 350 R5 that needs a lot attention and I would like to be able to give it the tlc it needs. I just have a few questions for you? Are parts easy to come by? I don't really have that much experience with engines but I am mechanically inclined and love a challenge. There is a chance that the engine needs some work, and do you think that with the help of some online materials and book help an engine overhaul could be done by a novice? I am looking forward to exploring your site more and thanks for putting it out there for everyone to see. Sounds a lot like my situation... I love everything automotive or motorcyclic in nature, but don't have much experience doing things myself. I just didn't have the space to work on my stuff that much - rowhome living did limit what I could accomplish on my own. I do enjoy the challenge though, and have jumped in feet-first by buying this bike and attempting to do everything myself. At least I could chain the bike up on the pavement while it was being worked on, and wheel it inside during the winter. I did however take the bike to a licensed HD mechanic to look her over just to make sure nothing major needed to be done... apparently all that was needed after 20 years of storage was a good carb cleaning! So in my case I was lucky. Just a little tinkering got her legal and back on the road. However, the bike isn't doing so hot at the moment. Seems the battery is not charging while running, so I need to find those gremlins and get rid of 'em. I have been busy buying a house and moving for the past few weeks, but the new place has a garage (!) so I anticipate a lot more work getting done in the near future! I started my R5 site as part scrapbook, part experiment, and mostly placeholder for all the links I found while combing the internet for R5 stuff... you see, there was no one site that had everything all together. I think that's why it's become so popular. So, I say, if I can do it, you can do it - what are you waiting for? The support is out there... get that stinker back on the road! OK, not really news, but cool stuff nonetheless. 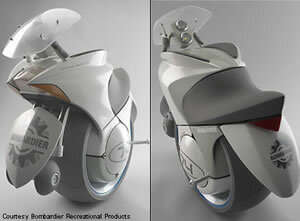 Yamaha's popular motorcyles have been realistically captured into downloadable paper models. Apparently, "the challenge level and your satisfaction guaranteed!" They even include the YZR M1 US 50th Anniverary Edition with the paint scheme discussed in my post on Friday, July 08, 2005. I had bought bar-end mirrors for the R5 and installed them when I put on the clubman bars. While I love the clubmans, the mirrors really got on my nerves... No matter how much tightening and adjusting, they just never stayed put. The one thing I could count on was a good view of the ground behind me - not good when you actually need to check your background for a quick lane change. Anyways, that's it for now... bike is due for inspection soon, so hopefully all this can get sorted out. I just bought my first bike last night. I had no clue what I really had until I started researching it online this morning. I definitely think I got a great deal after reading about this bike. It's been a one and half owner bike. I say half because the second owner had it for the last 5-6 yrs but never drove it. It was kept in his living room (seriously) since he got it. Anyway, the bike only has 5871 original miles on it and is still sporting the original rubber it had from the factory! There's only a small dent in the tank just above one of the emblems. It's coppery orange and black just like yours. The only thing this bike needs is a battery and I would like to replace the emblems. Even the seat is in mint condition! The fuel tank needs to be cleaned as it has a bit of rust in it but the guy who just had it was smart nough to disconnect the line from the carb so I don't think there will be any problem with the carbs. So I got this sweet ride for $500 Canadian (about $400US). Well just wanted to share. 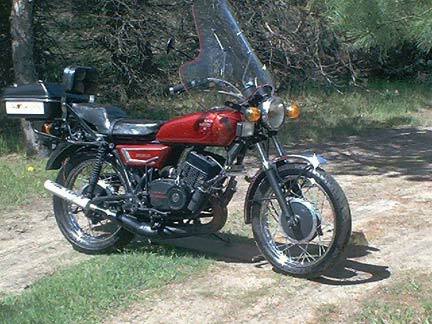 • This was my first bike as well, bought it from a fellow who accepted it as trade for construction work from the first owner and never really rode it...had only 3000 miles on the odo! So I guess you could say it's a one-and-a-halfer as well! 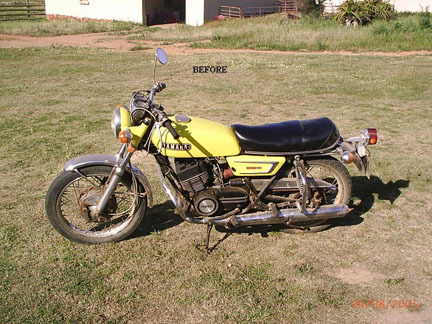 • Just like you, the only thing that needed replacing on the bike was the front tire... all the rubber was good, the seat pristine and the paint in great shape! It really is amazing how I'm seeing more and more of these bikes popping up... and not just on eBay. I've been seeing some R5s (although older) and RDs of the same era around my neighborhood... it's very encouraging, and a testament to the durability, ease of repair anf fun factor of these bikes. Anyway, thanks for writing in, Jennifer... have fun, and keep the rubber side down! I just happened upon your site while looking for a clutch cable for a 1971 R5 350. I have called and emailed dozens and dozens of people to no avail. No one carries it or has one. Do you have any suggestions on a contact? I would appreciate any help you could give me. I pointed SimonX to Classic Cycle Parts, a retailer with an eBay store... I haven't ever used them before, so I can't vouch for them... I think they only do online transactions via eBay. But they do have a 99.9% positive feedback rating, and have had over 15,000 transactions so far, so they seem pretty reputable. Anyone else had experience with these guys? One thing I remembered doing to my bike that I neglected to mention before was relocating the front turnsignal pods when putting on the aftermarket cafe bars. Sorry the picture isn't very clear - these were taken by the previous owner and posted as part of the eBay auction. 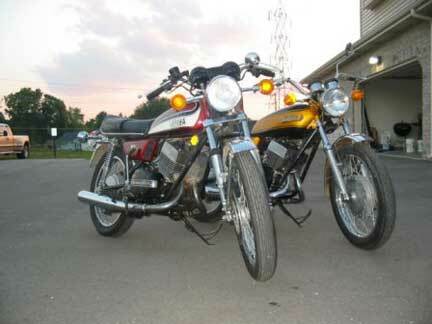 But at least you can see that the signals are not attached to the sides of the headlamp, but further back by the forks. You can see the bolts that hold the headlamp on just in front of the signal lenses. See the pic below for comparison. Is there any reason to why some bikes have the fork mounting location and some are mounted on the headlamp ears? Model year difference? Is this something owners did for better clearance, or what? I just picked up a 71 r5b for 500 bucks. Sadly, it wasn't as nice as yours, but it is at least a 1 kick starter. If you find yourself in ohio or closer to the state line sometime we'll have to go for a ride. excellent site by the way. it's probably the best and I would say maybe only r5 dedicated site out there. Keep it up! I was planning on doing almost exactly what you have done to your bike so it's been great seeing my bike the way it could be. It's nice to be able to go somewhere and get some motivation. I noticed your post about flooding out the carbs and I do the same darn thing now and then. I hate it when I forget to switch the petcock to off. I just got my baby to start again today after fiddling all day long. Black sludge and gas everywhere, smoking to beat the band... oh well, at least it finally kicked over. The fastest way to fix it is to either push it in 2nd gear for a while then kick it till you hear the carb sucking air when you turn the throttle OR if you REALLY flooded it over a couple of days (what I just did. We're talking a gallon of gas in carbs, engine and pipes) loosen the screws under the carbs and dump out the float bowls THEN start your kicking. Either way it's a nightmare. I'd like to think I won't do it again, but I'm sure absent mindedness will get me eventually. I'm rambling on.... awesome site is my point. Congrats on the bike, and thanks for the kind comments, Darby! It's funny, I really didn't set out to make this an R5 resource, as I really don't know all that much about the bike, or motorcycles in general. This is my first ever motorcycle, and I just wanted to catalog the process of resuscitating the bike and sprucing her up a bit. It didn't take nearly as long as I thought it would, so now that it's (more or less) finished, I just pop stuff up here from time to time... I'm glad it's helping and motivating some people! Crazy bimota Tesi 2D... rear and front swingarms? Which way is this thing facing? Check out the Rokon Ranger, a 2-wheel-drive bike that leaves a track lighter than a man's footprint, is the quietest gas powered all terrain vehicle on the planet, and floats. Came across this caffeinated Yammy the other day, thought I'd share. Company that makes chainsaws decides to build a motorcycle powered by 24 chainsaw engines. > new battery and sparks. The bike started up then quit. If you don't have one already get a good manual, Clymer or Yamaha. 2. Empty and clean the oil reservoir. Its plastic so it won't rust. Fill with a good quality premix. Golden Spectro or Yammalube. > a really great bike to ride. keep any small battery at full charge without worry. charging system itself. Could very well be the voltage regulator. Follow the manual in trouble shooting the charging system. its own pistons. Trust me on this one. It happened to me. 10am until 5pm + FREE to PUBLIC! Last year there was a nice selection of cafe racers, choppers and ratty bikes to oogle. Tons of rat rods and sweet kustoms too. I'll be bringing the R5 out, but not showing it, since nothing's been done to it since last year... or maybe I will... dunno yet. Yep, exactly that: your site has been extremely helpful in my quest for knowledge on the Yamaha 350! I recently had one *given* to me by a friend. It needs restored, it has been sitting for about 30 years. It is my first motorcycle, and I am enjoying working on it more and more every day. I'd just like to say thanks for all the helpful links on your site, and the cool, daily stories! Funny how I've been hearing a lot of similar stories about these bikes. When it was at Mike's shop, many people remarked how this bike was their very first motorcycle, the one they cut their teeth on. It's my first as well. I bought mine from eBay (see first entry way down below) but it too had been sitting around for most of it's life. 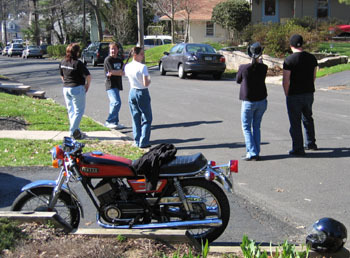 A number of scooter aficionados in my area have been looking into these bikes, as they are simple 2-strokes but a blast to ride, and many of them are finding them on the cheap, after lying dormant in some garage or backyard for the past two or three decades. This weekend, I had parked the R5 at Brian and Michelle's house, while Brian and I went to oogle Russ' new Mini. While we were there, apparently some guy in a primer-grey pickup with a snow-plow was driving down the street, and the driver was oogling my bike. Oogling so much that he hit a car parked on the opposite side of the street. So the driver gets out, surveys the damage, and - get this - gets back in the truck and drives away! While witnesses look on! Nice one, tool! Yet another person that should be locked in a Port-a-Potty, set on fire and pushed off a cliff.